Fight for Global Rights – Solidarity has no boundaries. Lesbian, gay, bisexual and transgender (LGBT) people suffer disenfranchisement, persecution and assault all over the world. We declare our solidarity with them. 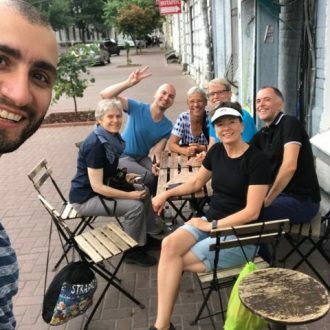 The Contact Group Munich Kyiv Queer, formed after Munich Pride in 2012, brings to the publics attention especially the Human Rights’ situation of LGBT-people in Ukraine. The city partnership between Munich and Kyiv provides a solid foundation for such a political engagement. Since then a vibrant and warm friendship between Munich’s and Kyiv’s respective LGBT-communities has developed. Over 150 LGBTI-people and allies held a Pride March in Odesa, the biggest city in the South of Ukraine. Munich made its point. 25 people from Munich travelled to KyivPride 2018. The delegation of the lesbian, gay, bi*, trans* and inter* community from Munich has never been so large and colourful. 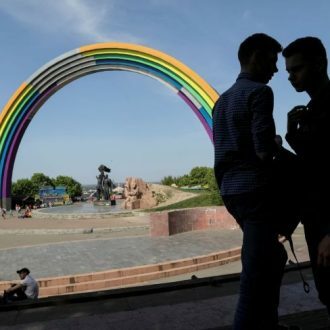 In our KyivPride Diary we report about our adventures. Business as usual. In 2017 the position of the Ukrainian LGBT community and the attitude of Ukrainian society and the state towards LGBT issues do not demonstrate any fundamental changes in comparison to the previous year. Let’s watch the semifinals (9th of May, 11th of May) as well as the big final show of Eurovision Song Contest in Kyiv on Saturday, 13th of May, each at 7.30 p.m., in Munich’s gay community centre Sub, Müllerstraße 14. Nothing touches, nothing moves a human being more intensely than movies. In many countries LGBT-people still have to fight for respect, especially in Ukraine and, of course, in Germany, too. Donate and support our work.